What Is Painting by Numbers? The paint by numbers approach is often ridiculed as being simplistic, uncreative, and formulaic. I believe it's helpful in getting across the concept that a painting is built up through multiple shapes of color. These shapes often don't make sense individually, nor look like anything "real", but put together as a group they create the image. The next step in developing as a painter is to learn to see such color shapes for yourself, without the aid of a printed diagram. Completing a paint by numbers project helps you learn to analyze a subject and observe areas of color. It helps you move away from focusing on what the finished subject will look like to looking at small areas and what color these should be painted. "'Painting by numbers' may not be as egregious a pursuit as one might imagine. Leonardo himself invented a form of it, assigning assistants to paint areas on a work that he had already sketched out and numbered." What's in Painting by Numbers Kit? A Painting by Numbers kit will include a brush, little pots of paint in however many colors you'll need, and a printed outline of the picture. It may not look like much paint, but it should be sufficient paint for completing the picture. You can, of course, always use any compatible paint you already have. 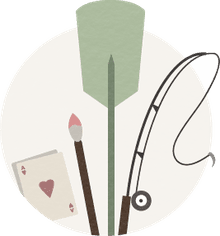 Be sure to check what type of paint the kit contains (acrylic and oil paint are the most common, though you do get kits with watercolor or pencils). We think an acrylic paint one is preferable to one with oil paint as the paint dries quickly and you use water to wash the brush, so it's easier for a beginner. It's tempting to paint so that you finish a section of the picture at a time, but that will necessitate a lot of brush washing and waste paint. Rather paint one color at a time, from the largest areas of this color to the smallest. Working from the top of the painting down helps prevent accidentally disturbing wet paint. By starting with the larger ones you'll be more practiced using the brush and paint by the time you get to the smallest areas, which can be quite fiddly to paint. Painting by Numbers is an excellent exercise in brush control. You know exactly where the paint should go and so can focus entirely on getting it down there, and only there. Having the brush control to paint accurately up to an edge or specific point is a crucial skill that every aspiring artist needs to develop. You'll use it, for example, when painting a background behind an object, adding color in an eye, or darkening a shadow of a vase, and wherever you want a hard edge on an object. The brush supplied is usually a small one, to enable you to paint the smallest shapes in the painting. It can make painting larger shapes very tedious so, if you've got a bigger brush use this too. Start with either the darkest color and end with the lightest or the other way around, leaving any segments that have a mixed color (double number) till last. The reason I recommend doing the colors in sequence from dark to light (or the other way around) is that this helps you learn a little about the tone and chroma of colors. Keep a jar of clean water for washing your brush (assuming it's an acrylic Paint by Numbers kit) to hand, as well as a cloth for wiping and drying the brush. Don't dunk the brush into the paint all the way up to the ferrule, just the tip. Rather pick up paint more frequently than have a glob of it fall off onto the painting. Be patient! Don't splay out the hairs of the brush in an attempt to paint in an area more quickly. This will quickly ruin the brush and destroy the fine tip. Apply gentle pressure to bend the tips of the hairs slightly and glide the brush along the surface. Think of it as the paper (or canvas) pulling the paint off the brush rather than using the brush to push the paint down. You'll notice some shapes have two numbers in them, not just one. This indicates that you need to mix two colors together. Equal proportions should give you a suitable color, but don't dip your brush from one paint container into the next as you'll contaminate the colors. Mix a little of the two colors on a non-porous surface (like an old saucer), then paint the area. If you try to mix the two colors on the picture itself (as in the top photo), it's easy to end up with too much paint and going over the edges of the shape. And to end up with unevenly mixed paint. Be meticulous about cleaning the brush before dipping it into another color. You don't want to contaminate a color. A little of a dark color very quickly makes a mess of a light color! If you do accidentally do this, don't stir it in but use the corner of a clean cloth or piece of paper towel to try to remove it.